Here are two photographs of Dorothy Peterson Sitts' wedding party. One photo shows Dorothy and Marland Sitts and the other (left to right) Barbara Peterson Mock, Dorothy Peterson Sitts, Marland Sitts, and Herbert McClain. Dorothy and her sister Barbara Peterson Mock made the wedding dress shortly before Dorothy married Marland Sitts at the Andover Lutheran Church near Windom, Kansas. 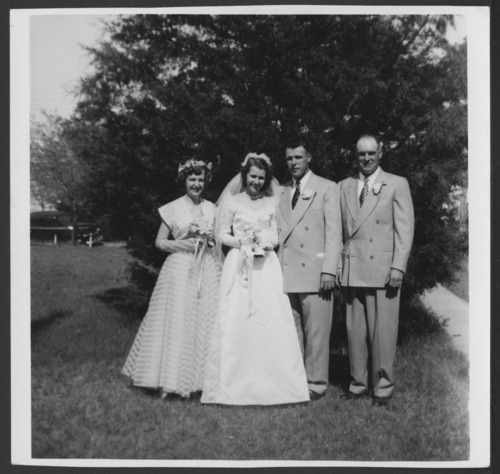 The dress was subsequently worn by Barbara Peterson Mock when she married Lyle Mock on May 26, 1956 at the First Christian Church in Hutchinson, Kansas. When Barbara's daughter was shopping for a wedding dress, she decided to wear the same dress her mother and aunt wore. The dress was a fit, and it only needed the lace at the neck line replaced. Rebecca wore the gown at her wedding to Robert Blick on August 9, 1980 at Park Place Christian Church in Hutchinson, Kansas. Each woman selected and wore their own wedding veil.